FellowCraft Stairway Lecture Rug Order Form. For well over 50 years in my lodge; Dalton Loge #105 F&AM, Dalton, Georgia, we have used a hand-painted rollout canvas floor covering illustrating the beauty of the FellowCraft Lecture. The FellowCraft initiate physically steps from one step to the next; as the Senior Deacon gives the lecture explaining each step. Thus, a greater understandings of the meanings expressed in the lecture are achieved by the FellowCraft initiate. As with all things, our beloved canvas floor covering has begun to show the ravages of time and use over the years. Since Dalton, Georgia, is the Carpet Capital of the World, I contacted a local manufacturer and showed them our old hand-painted canvas rollout and asked them if they could reproduce it on a high-quality carpet for us. 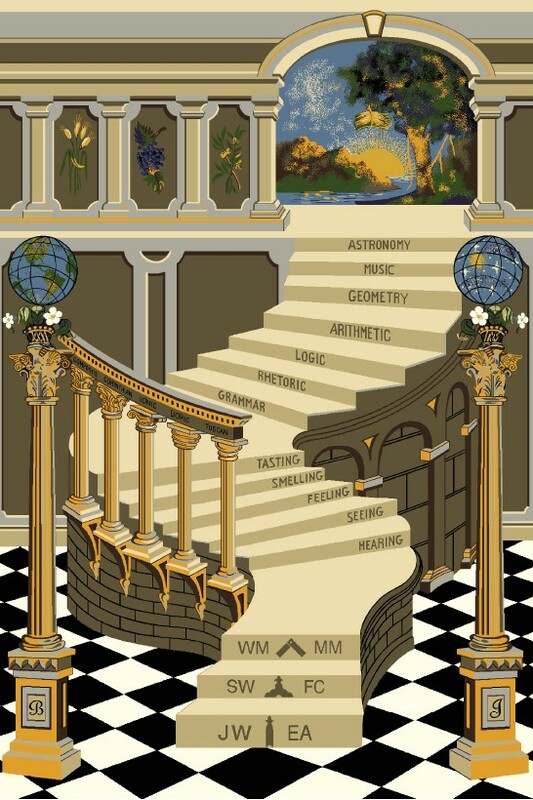 With the new hi-tech carpet manufacturing methods, I was able to have our FellowCraft Stairstep teaching tool reproduced on a luxurious 6' x 9' high-quality carpet... which should serve our lodge for the next 50 years; while our original canvas rendition holds its honored place in our archives. After seeing the beautiful job the carpet manufacturer did for us, I got to thinking that other Lodges may well want the same teaching / learning tool to use in their FellowCraft Lodge. To that end, enclosed is a full-color rendering of the Stairstep Lecture Carpet I had designed for our lodge. When you look at it, remember the lecture to get the full impact. But, as beautiful as the picture is, the carpet is even more vibrant and alive with all of the beauty of the lecture itself.